Experience TRIONICS revolutionary enzyme plant hair color developing system, and open the door to damage free hair coloring that lasts much longer without fading, leaving your hair in an almost virgin condition. Enzymes do not blow out the cuticle layer of your hair as peroxide does. Its condition will be far superior, much shiner, lustrous and healthy. Browns are richer, reds are brighter, and blonds are incredibly luminous. TRIONICS Plant Enzyme developers bring the very best quality hair condition and only choice for the highest quality hair coloring available today. TRIONICS Enzyme Plant Developers Are Natural and Effective! Natural Enzymes are specialized proteins which are secreted by certain cells of living organisms that accelerate chemical reactions without taking part in them. By isolating the right combinations of enzymes. Trionics Systems Inc. has developed a complete program to modernize services. Through the use of Trionics Products, a salon will perform higher quality treatment in only a fraction of the usual time. Modern Beauty Products, while greatly improving hair care, have not been without costly side effects. The proliferation of new chemicals, oils, and waxes in these products continually build up and severely impair services offered by most hair salons. Now, Trionics has solved the problems of excessive build-up and has substantially reduced the use of peroxide in hair coloring services. With the Trionics advantage, a salon will do more services in less time. Hydrogen Peroxide, until now a fundamental necessity in the hair coloring process had to be tolerated, despite serious drawbacks. Enzyme based formulas spread the cuticle scales enabling the solution to be inserted into the hair shaft. Peroxide solutions swell the cuticle until it bursts, leaving unwanted and unsightly hair damage. 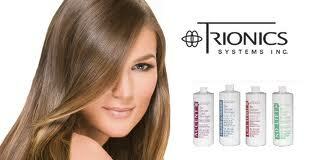 Trionix products generally cause no damage to hair or scalp. Moreover, they give true color which holds fast because there is no oxidation process. These products should be used or recommended by licensed hairdressers only.